Nine people have died in Japan when a care home for the elderly was flooded by heavy rains brought by Typhoon Lionrock. The typhoon swept across northern Japan on Tuesday night, bringing up to 300mm (11.8in) of rain. At least two other people are reported dead. 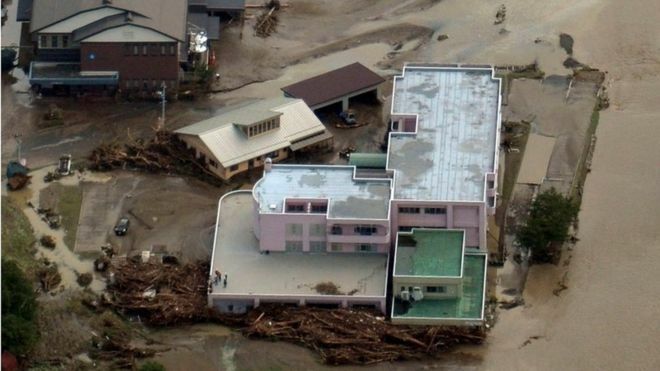 The care home, in Iwaizumi town in Iwate prefecture, was on the banks of a river but had not been evacuated. Lionrock has now been downgraded to a tropical storm as it moves over Russia. One emergency official told the AFP agency that the nine died after mud swamped the care facility. The victims have not been identified. The building is home to elderly people suffering from dementia, NHK reported. Typhoon Lionrock brought strong winds and heavy rains. It was the first to strike Tohoku, which covers the north-eastern part of Honshu island, from the Pacific since records began in 1951. Authorities in the area have advised more than 400,000 people to evacuate because of fears of landslides and coastal flooding, Kyodo reported. Flights and rail services have been cancelled and local manufacturers forced to suspend operations. On the island of Hokkaido, further north, rivers burst their banks. Iwate, one of the worst hit areas, is still recovering from the devastating earthquake and tsunami in March 2011.